A very relaxing experience...the results are realistic! We offer the complete range of Fake Bake products, helping you create the perfect tan. Jump in the shower and get ready to prepare your skin for the ultimate self tanning experience! Begin by using Fake Bake's passion fruit Body Polish. Particular attention is paid to the feet, knees and elbows and you'll be left with the softest, smoothest skin which is the perfect starting point for the Fake Bake ™ experience! After exfoliation a little Skin Smoothie is applied to the very dry areas such as your knees, elbows, heels and feet. This helps emulisfy Fake Bake and "smooth" out the tanner for a more professional finish. Fake Bake has moisturisers already built in but if your skin is really dry, we would recommend using our Oil Free Moisturiser under the tan. Please do not use a moisturiser containing oil as this can prohibit the tanning agents from working correctly and may affect the outcome of your tan. Fake Bake™ self tanning cream is applied starting from the feet up working in small circular motions. In the last five years the development of micro pigmentation has grown tremendously and has become the latest innovation in the beauty industry both within the U.K. and Europe. Micro pigmentation (or Permanent Cosmetics) is a form of cosmetic tattooing, in which hypoallergenic pigments are introduced into the skin in order to create a shadow or colour that mimics the most perfectly applied make-up in soft natural tones of colour. Because the pigment sits in the skin the effect remains with the client 24 hours a day and gradually fades over a number of years. Busy people with little or no time to apply cosmetics who are concerned about their appearance and want to look good 24 hours a day. Calgel and Susan Brookes will help your nails grow and look fabulous - naturally! A blend of organic chemical compounds to produce a unique nail styling product that will enhance your nails - safely. This flexible and durable U.V cured gel will strengthen and protect your natural nails. You can even have your natural nails extended with Calgel, without, using an artificial nail tip. The Calgel Nail System is a comprehensive range of nail care and enhancement products and treatments centred on Calgel - that is applied by brush after a little buffing to the natural nail. The application is applied by our trained and qualified nail technicians either working in salons and beauty parlours or at home throughout the UK. After application, Calgel is then cured for 30 seconds for clear or 3 minutes for colour under a UV light. Once cured the gel becomes a thin nail-like substance - natural looking and extremely flexible like real nails, but strong and durable without looking thick and false. A wide range of nail colours and designs to suit each client’s particular style, taste and requirements can then be applied onto this surface. This revolutionary nail product supports the growth and development of natural nails while providing an immediate and completely realistic cosmetic nail solution. 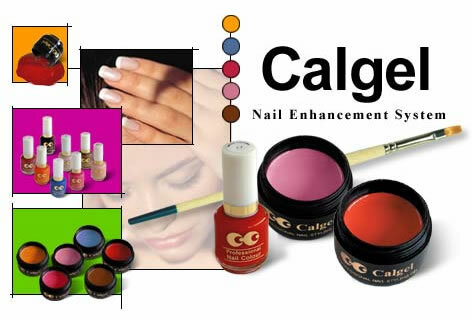 Calgel can also be used in conjunction with nail tips and other cosmetic nail enhancement products to make them look much more natural, even under close inspection. 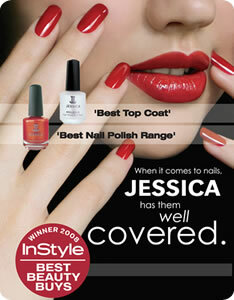 The Calgel Nail System is provided by fully trained nail technicians at Susan Brookes Clinic. Contact us for prices on Nail consultations and Treatments. Keep your hands, feet and nails in optimum condition all year round. Treat them with the same love and attention to which you treat your hair and body! Calgel is revolutionary product that won't crack, chip or peel. Applied to the natural nail, like polish, Calgel is everlasting and only comes off when you decide you want a change! Calgel is completely safe to use, and a pleasure to wear. It has been researched, tested, developed and refined over many years by nail experts and does not contain the chemicals and ingredients found in some other products which seal off and inhibit the natural nail. This means natural nails are able to respire and grow healthily under the protective layer of Calgel. It is porous, enabling natural gases to pass through the nails; ensuring that air is not trapped which consequently causes nail strength deterioration. Calgel can be applied and removed without damaging the natural nail growing underneath (with correct application and removal). It is self-levelling and can even be used over artificial nail tips to make these products seem much more like the real thing. To keep toenails and fingernails perfectly groomed, even as they grow, Colour Calgel can be easily painted over and removed without damage. Colour Calgel is available in a range of 80 glamorous semi-permanent colours with matching nail polishes, providing a co-ordinated look for hands and toes, complementing every woman’s wardrobe! Calgel nail technicians are fully trained and experienced in nail care as well as the Calgel system. They stock a wide range of nail protection and nail care products and provide invaluable advice to clients on improving natural nail care. Now both men and women have no excuse for not having hands and feet they can be proud of! "The Calgel Spa pedicure makes your feet look and feel amazing, and it's great not to worry about the chipping because the colour is applied as a gel that sets, and lasts up to 6 weeks"
"The Calgel manicure is great as it is long lasting and does not chip, peel or flake." "One reason why I hardly ever wear nail polish is because I can't find anything to withstand the spectrum of things I do in a day: work, kids, dog. But Calgel is indestructible and has changed the course of my nails for ever, it is utterly fabulous!" Described by the New York Times as "The first lady of nails" , Jessica Vartoughian is truly a success story. Raised in Romania by Armenian parents, Jessica went to America in 1962 possessing just a traditional European education in the care of nails, hands and feet. This turned out to be the basis for what became her life calling: to create a system of natural nail care unparalleled in its beauty and efficacy. Considered the world's foremost authority on natural nail care, hers is a unique understanding of the importance of what it takes to achieve and maintain naturally beautiful nails. The Jessica System, as it has come to be called, is based on an approach so different; it works like nothing else can.